The RIU works with partners to increase regional knowledge of serious, organised and complex crime. The NE RART is a multi-force and multi-agency team that uses specialist financial investigation skills, techniques and legislation to disrupt organised crime, remove criminals’ assets, protect communities and build public confidence in the criminal justice system. Identifying, investigating and disrupting such criminality is a key priority in reducing the threat to individuals and communities across all forces and regions. The Yorkshire & Humber ROCU is one of ten Regional Organised Crime Units providing specialist capability to tackle the increasingly complex threat posed by organised crime. 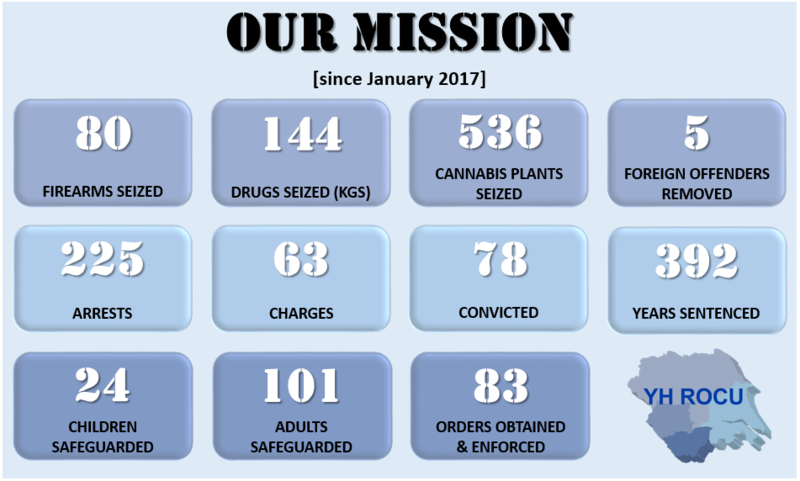 The specialist areas of work include: cyber investigation, digital forensic examination, financial investigation and specialist intelligence resources alongside traditional detective work tackling serious drug trafficking and firearms offences across Force boundaries. The specialist areas of work cannot be replicated within individual Forces because levels of confidentiality and costs would be prohibitive, so the four Police and Crime Commissioners and Chief Constables have invested in the Yorkshire & Humber ROCU under the lead Force control of West Yorkshire Police. The Yorkshire & Humber ROCU is funded by the Home Office and forms part of the strategic policing requirement set for all police forces in respect of serious organised crime. The Yorkshire & Humber ROCU works with national law enforcement agencies such as the National Crime Agency, Her Majesty’s Revenue and Custom’s, Crown Prosecution Service, Her Majesty’s Court and Tribunal Service, UK Visas and Immigration, Counter Terrorism Unit’s and Her Majesty’s Prison Service as well as international law enforcement partners such as Federal Bureau of Investigation, Europol and broader European Law Enforcement.